Summary: Sungmin’s always been a little skeptical, but this is clearly horrible luck. Sungmin’s been kidnapped twice in his life. By the same man no less. Part 1 ♦ Part 2 ♦ Part 3 ♦ Part 4 | This wasn’t what he meant by the hands of fate. Part 1 ♦ Part 2 ♦ Part 3 | And while they were so different, the two couldn’t help but get along. Kibum felt he was treading into dangerous territory once he realized that. Part 1 ♦ Part 2 | "If you find the seat so uncomfortable, there's always the trunk." Note: I know Kibum's not very popular nowadays, he's been away for too long, but still, I hope there'll be people reading this. This theme caught my attention out of the 100. Description: Kibum, younger son of a wealthy man, swore that he would never fall in love. Sungmin, only daughter of a rich couple, is considered to never fall in love, as no guy has captured her heart yet. Their acquaintance leads to a marriage of convenience, but can there be something more? Yesung and Ryeowook work for that, but there's a counterpart too, in the form of Kyuhyun. Summary: The odd day Siwon feels with missing Yesung and what has happened with Ddangkkoma? Summary: Due to one night, Lee Sungmin's shining aura went dull. For five years, she brought along the pain inside her that made her an introvert. She stayed away from people, though she only sticks to the people who supported her since that incident that she will never ever forget. However, when she reached college, everything about her changed... especially when she met a guy named Cho Kyuhyun. On the eleventh date of Christmas my date said to me... "Hi, my name is Kibum." And that's it. Prompt 1. Handcuffs, "just one more". Rating: PG | Genre: Romance/Drama | Disclaimer: I don't own them. Plot is mine. Summary: Some grudges can be held for years. Some feelings, longer. "I think if you just asked, we could have avoided this." 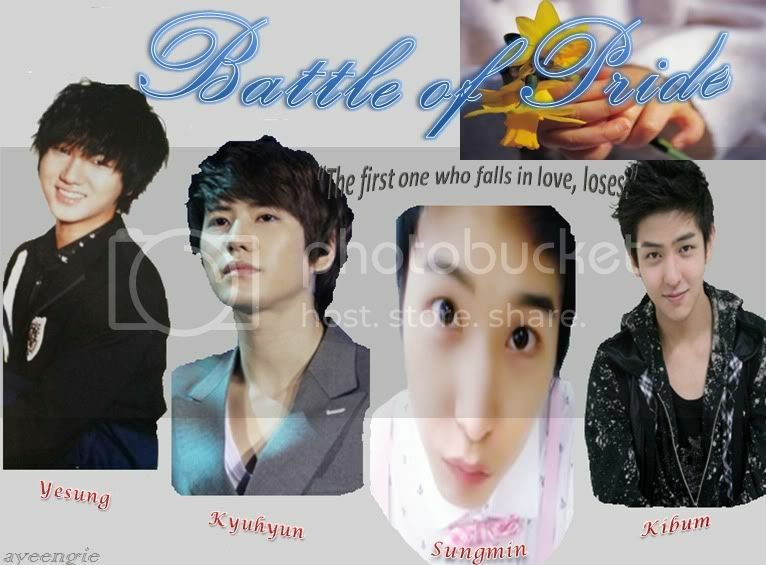 Summary: Compared to everyone else he had ever dared to fight for Ryeowook's affection, never had he faced such an opponent. One who lived under his own roof no less. Summary: He really hates how close and touchy they are, but being stubborn is proving to be his worst ally. Summary: Persistence and hard work is a motto he both respected and follow. Except when the one after him abuses those very things. summary: Sungmin and Kibum have a rendezvous under the stars. Summary: No one can control our fate. No one can escape fate. It will immediately come to you in a unique and unexpected way. Summary: Hangeng can't speak Korean, which is strange because he's just started at a Korean college in Seoul. Siwon takes Hangeng under his wing, feeling sorry for the foreigner but he seems blind to the strange going ons that seemed to have followed the Chinese man to the campus. Who is the stranger who's taken a liking to Sungmin and why can't any body else see the man who's started to follow Heechul?